Microsoft Research Redmond researchers Hrvoje Benko and Scott Saponas have been investigating the use of touch interaction in computing devices since the mid-’00s. Now, two sharply different yet related projects demonstrate novel approaches to the world of touch and gestures (find also Serious Games Bringing Interactive Properties to Everyday Surfaces). OmniTouch gives users the ability to make an entire wall a touch surface, while PocketTouch enables users to interact with smartphones inside a pocket or purse, a small surface area for touch. Both projects are being unveiled at UIST 2012, the Association for Computing Machinery’s 24th Symposium on User Interface Software and Technology, being held Oct. 16-19 in Santa Barbara, Calif.
OmniTouch: Wearable Multitouch Interaction Everywhere—co-authored by Chris Harrison, a Ph.D. student at Carnegie Mellon University and a former Microsoft Research intern; Benko; and Andy Wilson—is a wearable system that enables graphical, interactive, multitouch input on arbitrary, everyday surfaces. It utilizes a pico projector to display the interface on a surface — whether it’s a wall, table, arm, lap, leg, or what-have-you — then employs a custom-built short-range depth sensor (similar to a Microsoft Kinnect) to track your fingers as they type. Perhaps the most convenient aspect of the technology is how it can be operated on the go, requiring no special calibration for each new surface it is used on. The system adapts easily to surfaces of most textures in 3D space, so it works even when the surface is not flat, such as with your hand, or perhaps a tree trunk. The only inconvenient aspect of the prototype is the bulkiness of the camera and projector, which are mounted on a user's shoulder like a large parrot. The good news, though, is that future prototypes are expected to be much smaller, closer to the size of a matchbox. PocketTouch: Through-Fabric Capacitive Touch Input—written by Saponas, Harrison, and Benko—describes a prototype that consists of a custom, multitouch capacitive sensor mounted on the back of a smartphone. 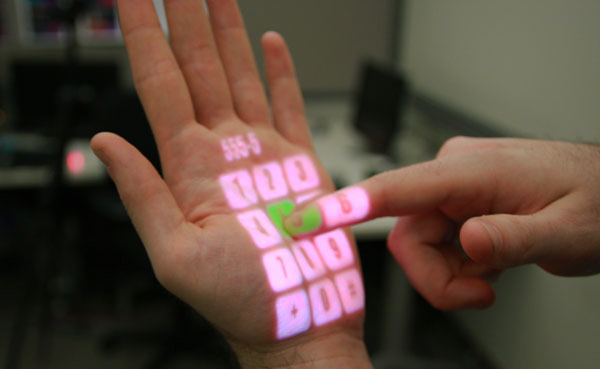 It uses the capacitive sensors to enable eyes-free multitouch input on the device through fabric, giving users the convenience of a rich set of gesture interactions, ranging from simple touch strokes to full alphanumeric text entry, without having to remove the device from a pocket or bag. Benko also stresses that both OmniTouch and PocketTouch are evolutionary steps of a larger effort by Microsoft Research to investigate the unconventional use of touch in devices to extend Microsoft’s vision of ubiquitous computing. He notes that PocketTouch has a lineage dating to the Mouse 2.0 project and work on the multitouch pen, while OmniTouch shares concepts in common with LightSpace.